Mission complete: Who am I now? Jessica Witer, of Anna, third from left in back row, poses with fellow missionaries in Namibia. Witer spent 10 weeks in Africa with a group organized by Experience Mission of Fort Wayne, Ind. Jessica Witer, of Anna, embraces Namibia, all of Africa and her experiences as a missionary as she watches a lunar eclipse in August. 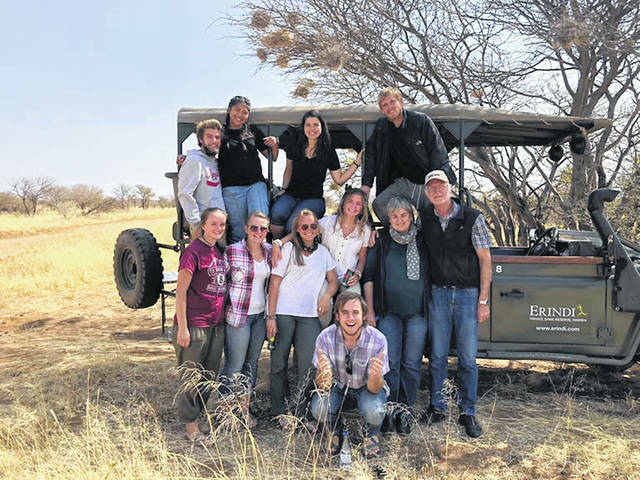 Editor’s note: Jessica Witer, of Anna, returned Aug. 10, from a summer in Namibia, Africa, on a mission trip. 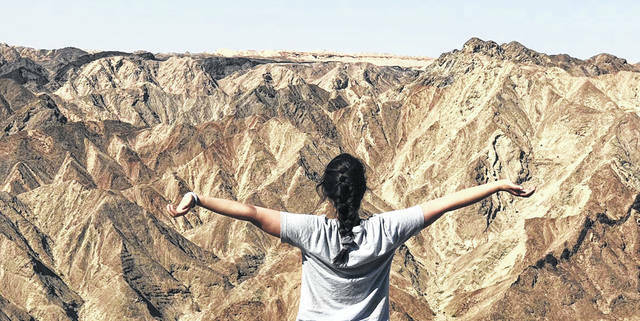 SWAKOPMUND, Namibia — Who am I now? We have completed our mission in Namibia and are about to head home. When I reflect now back to the beginning of this trip, I remember I was very scared. I was scared of the unknown. I was afraid of the people I hadn’t met, the places where I’d never been, doing things I’d never done. I was scared of danger. I was afraid of the airplane, the dangers associated with Africa, getting ill or injured, even losing my life. I see now that I was both right and wrong. I was wrong in the sense I had nothing to worry about — the people, the country, my safety, etc. But I was right, in a sense, when I was worried I’d die, because who I was when I left is now just a part of my history. I am no longer who I was when I was a child or a teen or just graduated from high school. And now I am no longer who I was only three short months ago. The version of myself that walked out my front door, May 21, 2018, will never walk back in. When she left, she left permanently. It might sound strange, but none of us is exactly as we were yesterday. It might take one month or one year or even 10 years, but eventually, each of us reaches a point in our growth that we beome an entirely new person from who we were at some other point in our life. That person is gone, and I believe that is a very good thing. Not that there was anything wrong with me then, but the changes I felt and the experiences I lived affected me in a way that I think has made me so much better. Which leaves me wondering: How can I go back to the same place and be with the same people and do the same things when I am no longer the same? I struggled with this question for over a month of my trip when I realized the answer: I can’t. I may have changed, but my love for the people I know has stayed the same. My relationships with each of these people I love will be different, but my hope is that they change for the better, too. Realistically, I know that there are people who won’t like the way I’ve changed or the effects of this change on our relationship. These relationships might suffer or even end. But I can finally see that that’s OK. I’ve grown too much to be willing to risk backtracking. Who I am and what I’m going through is too important to me to not be given priority. So who am I then? Who is it that’s returning home? Someone who spent three months of her life with total strangers. Someone who has given speeches and testimonies and scriptures to dozens of classes of students of all ages. Someone who has been called “Mom” by a small boy who wanted nothing else but to be held. I am someone who has gone so far outside my comfort zone, I couldn’t even find my way back to it. Who has slept for weeks at a time in hostels, with host families and in tents in a desert. Who has lived out of a backpack, climbed Dune 7, wandered through new cities, patched a roof, done dishes and washed clothing in buckets. Someone who is capable of so much more than I even imagined. I am someone who decided to do this — and did.